Usually, when people take a trip, they do it at a leisurely pace. I love trying new foods when I go anywhere, as you well know by now, so the opportunity to eat foods from all over the world in one place is always appealing to me. 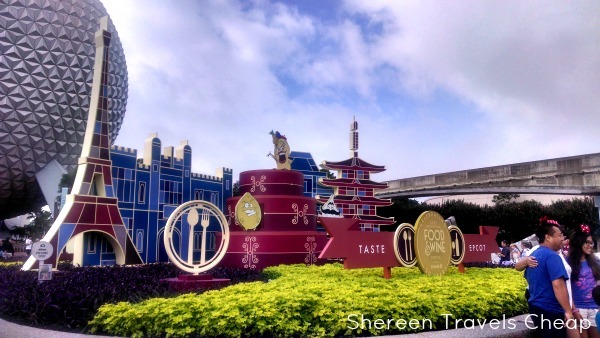 Last month we hit up Epcot's Food and Wine Festival to taste some of the world's dishes. 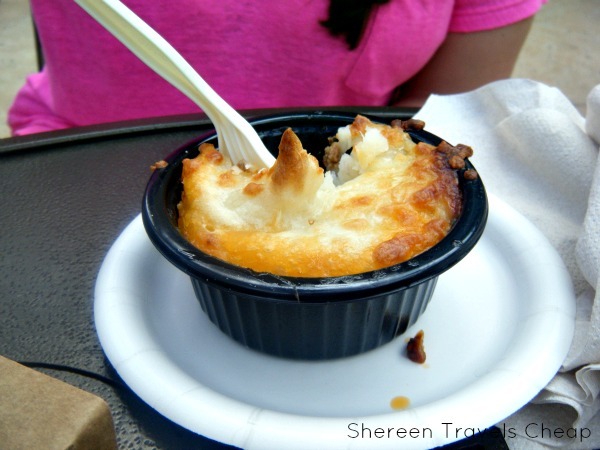 This is our third time to visit the festival, as it brings together all my favorite things: weird food, food carts and small bites. I was super excited that Scotland had been added to the festival this year, as well as Patagonia and a few other places. Unfortunately, there were a lot of foods I could get at home, so I had a short list of what I had to try. 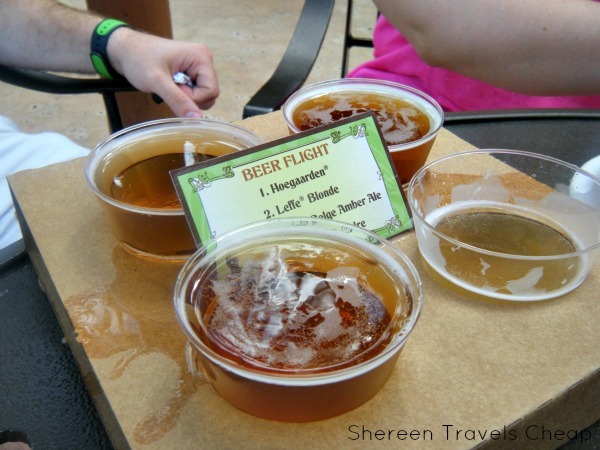 The great thing about Epcot is that it's mostly for adults and has few rides. In fact, World Showcase now has only one and it's a boat ride like Small World. Eventually, Norway will have a ride that is Frozen themed to replace Maelstrom (another boat ride). It is really about bringing the best of countries to people and helping them learn what each destination is all about through shops, reproduction landmarks, food and entertainment. Even so, we have been there at least six times and still haven't seen everything. Being there on a Saturday when everyone else was trying to eat and drink themselves stupid really gave us a chance to explore. 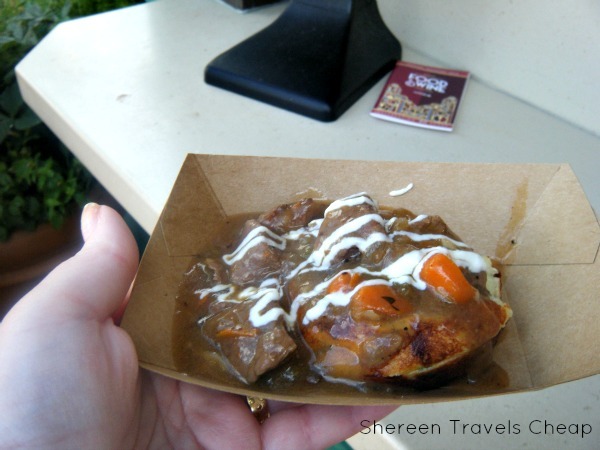 Each country represented at World Showcase has it's own kiosk with foods from that destination. 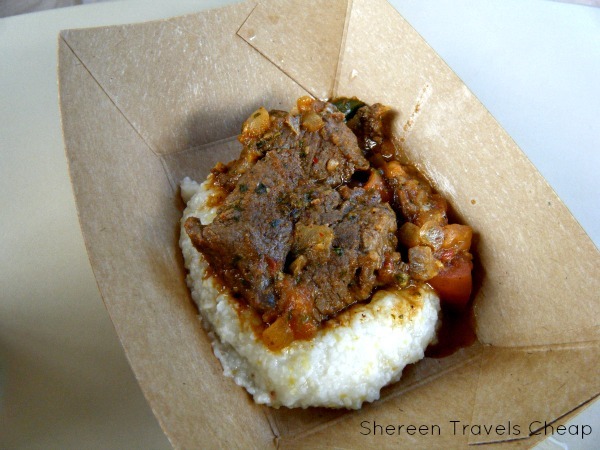 In between you'll find carts serving dishes from other countries of the world. Each one has entrees, desserts and drinks (basically alcoholic options that come from that region). I wasn't enamored by either of these, but Eric was hungry and these were his choices at the time. 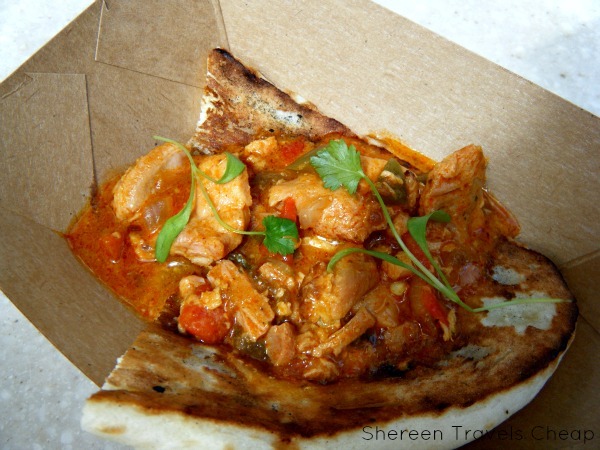 The best part of the beef was the pap and the best part of the chicken was the naan. I chose the drink as something that sounded interesting. 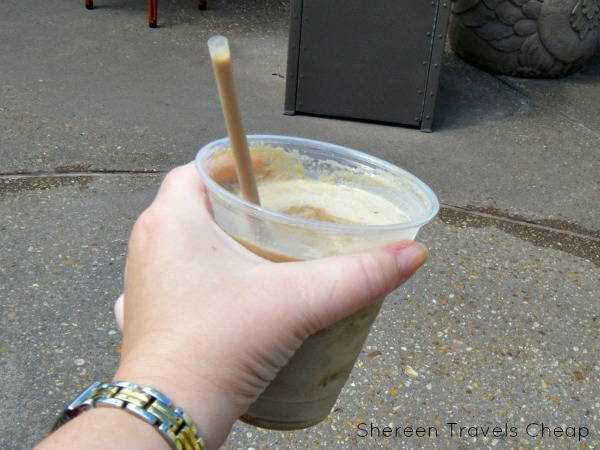 It was a Coke slushie with Amarula, a liqueur like kahlua. It was not an $8 beverage, but it was refreshing and was interesting tasting. Kinda chocolatey. We had to wait a bit for them to get more potatoes to make these waffles, but man was it worth it! 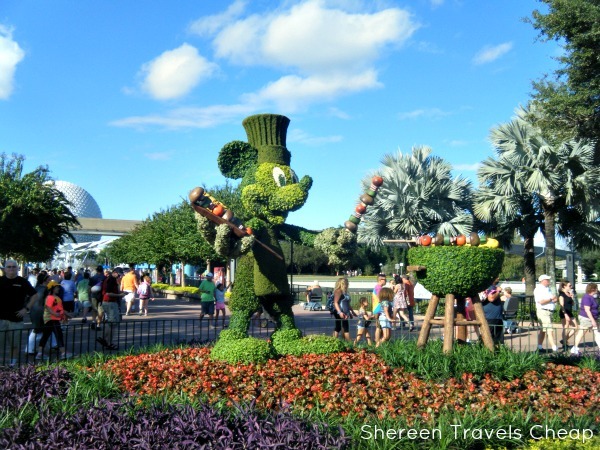 I'm hoping my box of souvenirs comes soon, so I can see if the recipe is included in the Epcot cookbook. I'd be willing to buy a waffle iron just for this. I'm almost sad that we only got one to split. I'm not generally a big beer drinker, but I was waiting around and the name of this one jumped out at me, so I figured I was destined to try it. 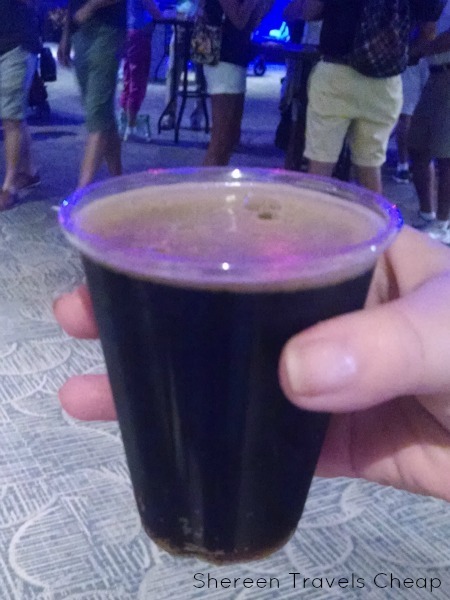 This was a thicker beer like Guinness with a delicious chocolate scent and I loved it. I may have indulged in a flight of beers that included this one, but we were right on the heels of dinner reservations, so I just stuck to the one. This was on my must-eat list and I'm glad it was, because it was delicious. 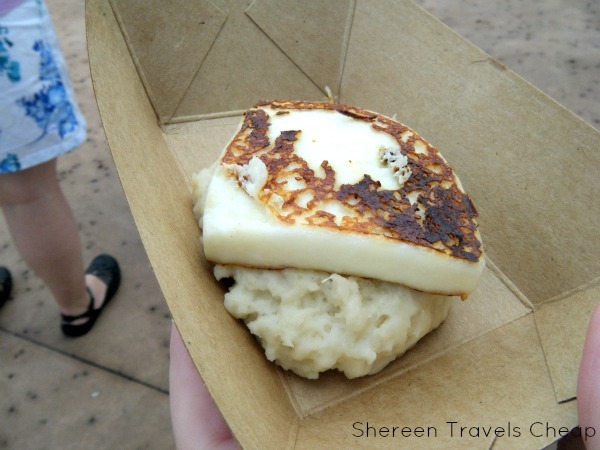 I'm not sure what I thought yuca would taste like, but it wasn't this pleasant mashed texture that was a little sweet and somewhat bland. I could see this being a staple in my house if I lived anywhere it was available. The grilled cheese on top was definitely different, but added a fantastic element and another layer of taste. 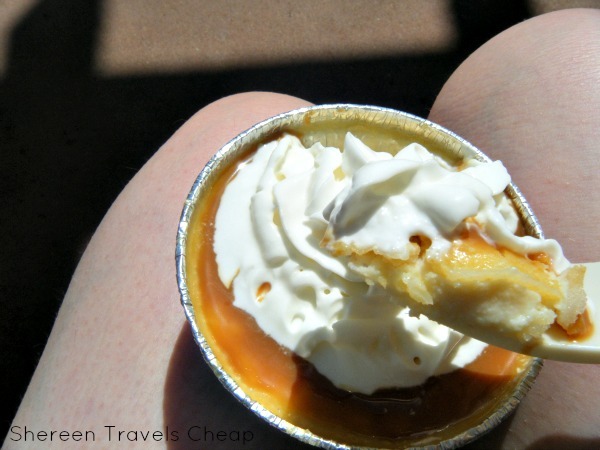 I think I wasn't sure what this would taste like at all, but I saw corn cheesecake and was all over trying it. I think I was expecting a sweet cornbread, but what I got was an awesome creamy dessert that was sweet, but not too sweet. It was a great afternoon treat and I was glad we ordered two so I didn't have to share. 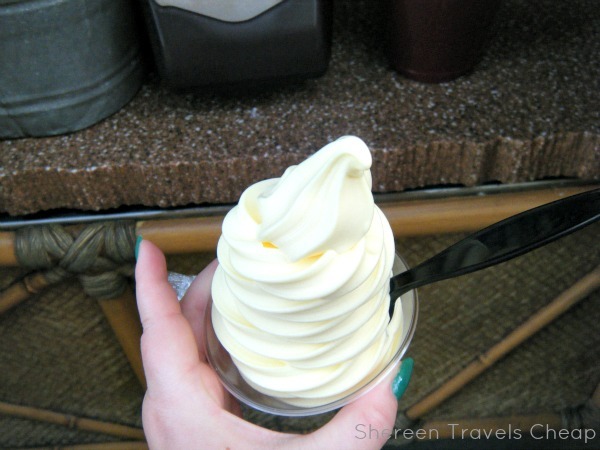 You can't take a trip to Disney and leave without having Dole Whip. It sweet and cold and basically the best thing ever. You can only get it a few places in the world: Disney, the Dole Plantation in Hawaii and maybe your local FroYo shop. 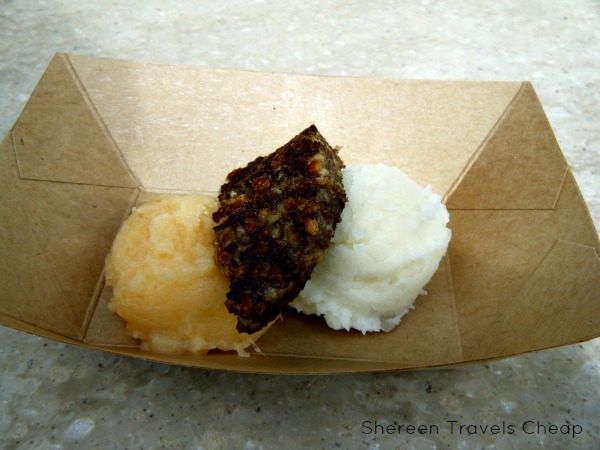 I have been wanting to try haggis for a long time now. Unfortunately, I am not willing for my first taste to be from a can and I can't particularly afford a trip to Scotland right now. Having never seen it before, in my mind I figured it would be stringy and possibly chewy with some sort of weird tripe flavor. Well, I had to try it once just to say I had. I didn't expect it to be super tasty, but it totally was. Also, I think mashed rutabaga (turnips) needs to be in my repertoire now, because yum. 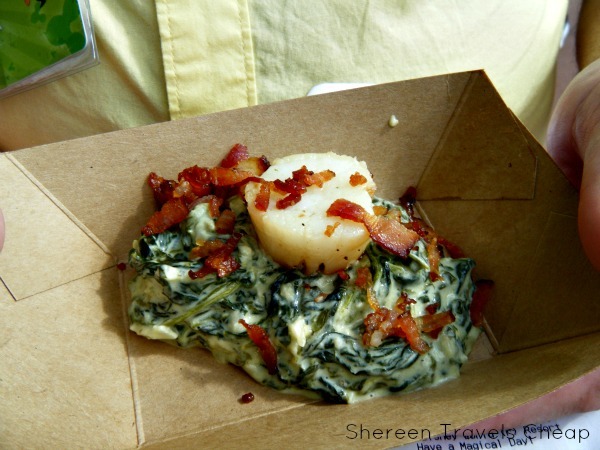 I had some of the spinach gratin on Eric's dish, which I thought was fab. He said his least favorite part of it was the actual scallop. So, I guess we know now that Scotland knows how to make red meat and veggies really well. I didn't actually have the following things, but some nice people we shared our table with let me take pics of them and told me they enjoyed them. I didn't actually make it to everything I had hoped, as I wanted to try mead and Hungarian wine, but there's only so much time and so much you can eat and drink. 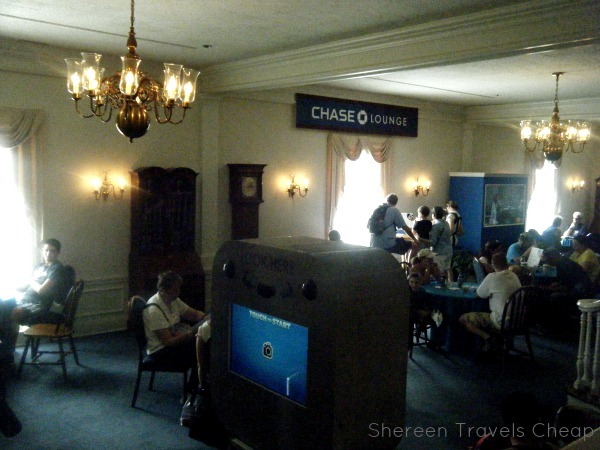 We were able to take advantage of the Festival Chase Lounge that was only available to Chase credit card holders. This was found on the top floor of the American Adventure Pavilion (of which we still have yet to watch the show) and featured free drinks, some comfy places to sit, the chance to try out some of the newest Disney Infinity video games, outlets to charge your phone and a selfie booth to remember the fun you had at Epcot. If you were a Disney Chase card holder, you had the option to get some extra freebies and book exclusive experiences. Shockingly, they were happy to sign you up for one on the spot. Look at the menus ahead of time to see what's on offer and pick your "must try" dishes and drinks. That way you can make sure to hit those kiosks above all else. Avoid the weekends. We were there on Saturday and the lines were crazy long. Of course, we didn't have to wait long for rides and other attractions. If your only option is the weekend, go as soon as the open and get in line the second they let you into World Showcase. We did this on Monday and were the first ones at a few of the kiosks and only had to wait for the food to be put together. Even if you can go on a weekday, get there as soon as World Showcase opens (which is usually 1-2 hours after Future World opens. Go hungry. We had a light breakfast so we would be starting fresh when we hit the food. Bites may be smallish, but several can make a meal and can fill you up. Be nice and share your table if you have free chairs. Tables fill up quickly and trying to balance food and drink and eat while standing up is not fun. We offered to share our table with people and they were immensely grateful, plus you meet new people. On the other hand, people are nice, so are probably into sharing their table with you if you ask.